These Remote Controlled Power Strips (iP-815) allow web browser control of eight A/C power outlets. These units connect directly to 10baseT Ethernet and are IP addressable. Each outlet can be independently turned on, off or cycled for power-on reset (re-boot). 4 outlet models can be easily expanded to eight outlets. These Dataprobe iP-815 units use standard NEMA 5-15 North American Line cord and Outlets. The Dataprobe iP-815 are controlled from a web browser. Once a connection is established and a security login is approved, each of the outlets can be controlled by clicking on the appropriate hotlinks. Toggle and Timed Cycle functions are provided. The status of each outlet is clearly displayed. 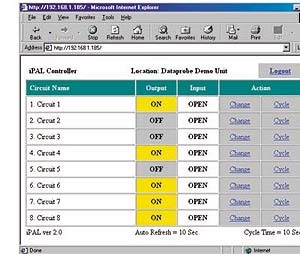 The Dataprobe iP-815 unit can also be controlled from a Telnet client using menu selections. Question: Hello, would you have any Dataprobe iP-815 for sale? If so, how many and how much? Answer: Thank you for your inquiry. Unfortunately this device has been discontinued and we do not have any available for purchase. Depending on your particular requirements, there are a number of different devices with similar functionality available. If you would like assistance in finding a replacement, please contact us at 1-877-586-6654 or via our online chat feature to discuss your project in greater detail.